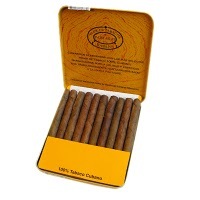 Partagas Minis | Old Morris Tobacconist Victoria BC, Fine Cigars, Humidores and Tobacco Merchantile. Yet another undersized yet supremely talented Cuban with great earthy character. Excellent for a rapid-fire smoke between meetings or while you're waiting to rock the show.